Learn how to draw Spongebob Squarepants! Here we will show you how you can draw Spongebob yourselves. We have a step by step guide and a video showing how to draw him. 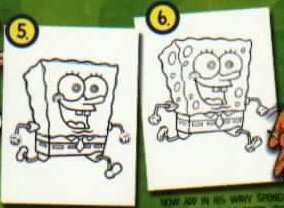 The following directions on how to draw spongebob are from the Nabisco Fun Fruits Nickelodeon Fruit Snacks®. 1. Start off with a slightly wedged rectangular sponge shape. Divide it into sections as shown. 2. Draw two circles resting on the center lines. Add an oval for a cheek. Draw in the mouth and the upper lip. Add four slightly curved triangles, two on the bottom and two on the side, just above the dividing line. 3. Add lashes on the eyes. Draw in a tongue and L-shaped tubes for arms and legs and end them with circles. 4. Now carefully draw in the nose starting from and ending on the vertical drawing line. Add two squares for his buck teeth. Draw in Spongebob's shirt collar and tie. Now for his shoes, draw a peanut shape that will go over the circles you drew there before. 5. Draw in the pupils. Add freckles and the lower lip line. Start to draw Spongebob's fingers. Make his belt loops as simple rectangles. Draw in two small rectangles at the base of his heel. Oh, and draw in three curved lines just under his knees on each leg for his socks. 6. Now add in his wavy spongy outline, add in his spots. Complete the fingers and finish Spongebob's shoes by carefully adding the bottoms. Viacom International Inc. and Nickelodeon neither sponsors nor endorses this site. This site is not affiliated with Viacom International Inc. and/or Nickelodeon. Spongebob Copyright 1999 Viacom International Inc. All Rights Reserved. Nickelodeon, Spongebob and all related titles, logos, and characters are trademarks of Viacom International Inc.
or endorsed by Nickelodeon, Nick .com or Viacom. All trademarks for Spongebob Squarepants and copyrights on this page are owned by their respective owners. This is a Spongebob Fan website.